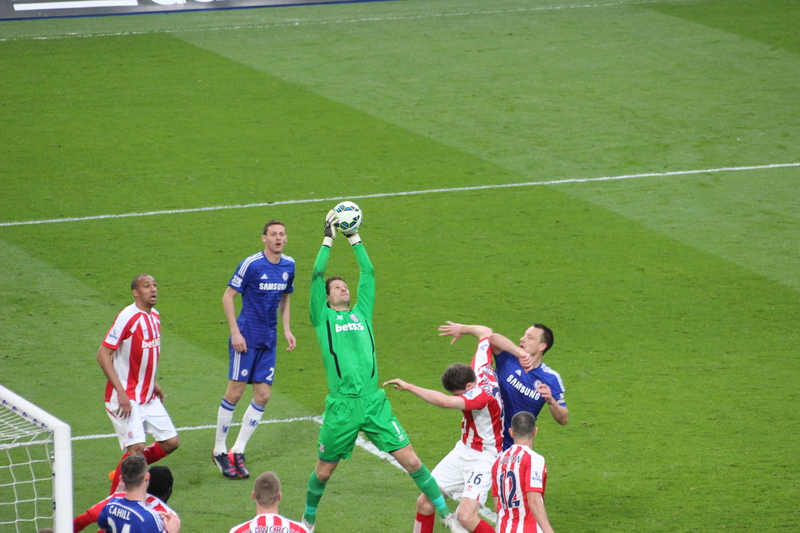 Stoke City vs. Chelsea : 27 October 2015. After Saturday’s narrow loss to West Ham United, here was a chance for immediate redemption. A trip to the Britannia Stadium for a Capital One cup tie against Stoke City offered the chance for a little respite from the travails of our surprising implosion in the league. Here was a match in which we could show some fight and bottle. Here was the chance for a calming victory ahead of two monumental home games against Liverpool and Dynamo Kiev. Here was the opportunity to halt our faltering slide. Or, if some sections of the media would have it, here was a potential banana skin on which Chelsea Football Club could have an almighty slip. In other seasons, perhaps, I may not have fancied a three-hundred mile round trip during the week for a League Cup tie. Historically, this game might have been one that I might have missed. However, I have an emotional tie with the city of Stoke-on-Trent which meant that I had decided as soon as the draw was made that I would be attending. I have not missed a Chelsea game in my old college town since a League Cup tie in 1995. I have attended all eight of our games at Stoke City’s new windswept stadium at the top of the hill. Parky was “up for it” too. And last week, Glenn decided to go. The more the merrier. I left work bang on 3.30pm. Ahead of me, unfortunately, was a grinding three and a half-hour journey, with the early winter evening enveloping us in increasing darkness, in to the heart of The Midlands. I was forever clock-watching. It was a tedious journey, thankfully enlightened with banter along the way. Once again it seemed that Chelsea Football Club was at the eye of a media storm. All of the focus was on us, and our manager – and owner – especially. From reading opinions of supporters both in the UK and abroad, both old and new, it was clear that there was a myriad of views. The majority, I have to say, were in support of the beleaguered manager. Yet opinions were hugely varied. On one hand we had the slash and burn merchants, who wanted the club to dispense of the services of Jose Mourinho, citing the clichéd “losing the dressing room” as one of their main reasons, though there were others. That’s a pretty extreme view in my opinion and not one that I adhere to. And it would be easy, too easy, to make the broad-sweeping assumption that this view was that of the new wave of post Roman, post 2005, post Munich “Johnny Come Lately” half-and-half scarf-wearing new supporters that have sprung up in various parts of the world. This is the view, too, of a few of the so-called “old school” fans also; that we should get shot of Mourinho the loose cannon. On the other hand, we have the pro-Mourinho faction who believe that dispensing with the services of Chelsea’s most successful manager ever – let that sink in – would be a sure sign of idiocy on a grand scale by the Chelsea board. There was even talk in some quarters of allowing the manager a leave of absence in order for him to be with his very ill father in Portugal, and for him to get his head straight after an increasing number of typically rambunctious outbursts. The view was that Mourinho was “one of our own” and that the club “owed him one.” This is more in line with my feelings. Did you expect anything else? But I am not a fawning sycophant either. I certainly acknowledge our manager’s odd idiosyncrasies. Some of his outburst have made me cringe. And yes, Mourinho is a cantankerous bugger at times – though, which successful manager isn’t? – but I take great stock in the wise words of respected former players who continually triumph our manager’s fastidious preparations, tactical nous, man-management skills and his love of the club. Some of his decisions this season – well documented elsewhere, I won’t bore you – have been odd. But I honestly have to say that I find it hilarious – I mean, really hilarious – to read the opinions of various Chelsea supporters who sanctimoniously and pompously deride one of modern football’s greatest managers. And yes – I know – we all have opinions. That’s OK. That is a given. What is the famous cliché? “Football is all about opinions.” Yep. But unfortunately, sadly, I have to read some of them. It’s lovely – just lovely – when a back-bedroom keyboard warrior in Badgercrack, Nebraska, armed with no experience of playing the sport, nor coaching it at any level, but a rich history of gaming skills on FIFA2016 (“we need to buy Bale as he is awesome”), a nerd like devotion to spending a vast fortune on every Chelsea shirt from the past ten seasons (“no, I can’t afford to travel to London to see The Chels”) and a stomach-churning sense of entitlement (“we have to win at least two cups this year”) starts deriding Jose Mourinho. At around 6pm, Glenn noted on Facebook that some Chelsea supporters were already ensconced in a few Stoke boozers. Eventually, I was parked up. It was bang on 7pm. Just right. I had predicted a crowd of around 20,000, but the roads around the stadium were full of cars. On the slow ascent up the hill and over the canal, the lights of the stadium lit up the darkness of a Staffordshire evening. Inside the stadium, it was soon clear that we had brought reassuringly large numbers up to The Potteries on this Tuesday night. The away section – an entire end, just like my first visit for that FA Cup tie in 2003 – was filling up nicely. This was a great show of strength from the Chelsea support. There were rumours that the entire Chelsea board had traveled up for the game. I have to be honest, I was surprised by my reaction to this. At first I thought “ah, good for them – showing support for the team and manager.” But then, another thought entered my head. We had discussed options for the evening’s team on the drive up. In the end, the manager went with Begovic, Baba Rahman, Terry, Cahill, Zouma, Mikel, Ramires, Oscar, King Willian, Hazard, Diego Costa. Before the game, the crowd were treated to the appearance of some members of the League Cup winning team of 1972. In normal circumstances, this would not illicit much of a reaction from the Chelsea following, but the mere mention of the name Gordon Banks meant that these players were given a good round of applause as they posed for photographs. Banks, a World Cup winner in 1966, is one of our most revered football icons. I last saw him at a Tony Waddington testimonial at the old Victoria Ground in the last few months of my life as a student in 1987. It was lovely to see him again, along with some familiar – in my memory – names from the past such as Terry Conroy, Mike Pejic and John Mahoney. That win – against us of course – in 1972 is Stoke’s only piece of silverware. I wonder if their fans are quite so needy. There were areas of empty seats in the periphery of the home stands, and a few empty seats in our end, but this was a healthy crowd. The fact that the ticket prices were just £20, and that this was half-term, meant that there were many more schoolchildren in attendance than normal. With that very quaint, ‘fifties-sounding “We’ll Be With You” song accompanying the teams on to the pitch, the noise was ramped up and the 4,500 or so away supporters were in good voice. Chelsea began really well, attacking the home end, The Boothen End, away in the distance. This was more like the Chelsea of old, with intelligent passes from Oscar setting Hazard away down the left, and solid work from Mikel and Ramires allowing Willian to shine. Diego Costa looked a threat. We created several chances, though Stoke enjoyed a couple of efforts on our goal too. An overhead kick by Muniesa just dropped over. There was a neatness to our play and it was pleasing to see. Very soon in to the game, the away support rallied behind the manager with loud and extended shouts of his name. It was clear from the onset that the team, the supporters and the manager were as one for this tough encounter. As it should be on game day. As I have said before, save the internet jousting for now, and the moans for the bar and car; match days should all be about supporting the team. A lovely move set up Ramires, but from a very tight angle he could only hit the side netting. It was the closest that we had come. In the stands, the noise was impressive. There were songs for Dennis Wise, Jimmy Floyd Hasselbaink and Tore Andre Flo. Sadly, Diego Costa was forced to leave the field, after play stopping on two occasions for our medical staff to attend to him. Loic Remy entered the fray. A ferocious effort, again from an angle, from Hazard was blocked well by Butland. Just before the break, Stoke’s best chance of the entire game was snuffed out by a fine falling block by Begovic at the feet of Walters. There was positive noises at the break; this was better, though the thought of extra-time and penalties (I wouldn’t be back home until around 2am, and I’d have to be up for 6am) loomed large. The mood within the Chelsea end changed a little. We became more anxious. Three visitors from Scotland – Glasgow from their accents – behind me provided a constant barrage of negativity. Elsewhere the songs of support were quieter. I became a little frustrated with the lack of movement, but we kept the ball well. Kurt Zouma was an unlikely threat on the right and he crashed a low shot against the base of Butland’s bar. Around me, a few Chelsea fans began singing a song from our recent past which doesn’t get aired too often. I first heard it at a wet Fratton Park in 2010. It slowly grew as more and more fans joined in. Blind faith, positivism or irony? Mourinho replaced Ramires with Traore. Things were looking desperate as the ninety minutes neared. To be honest, despite all of our possession, I simply could not see us equalising. We won a corner and Willian planted the ball in the six yard box. Like at West Ham on Saturday, King Kurt managed a touch, and the ball fell invitingly for Loic Remy to smash high in to the net. The away end exploded, with bodies falling forward, and arms flailing everywhere. There is nothing like a last minute goal, to win or at least to draw. Now the Chelsea fans roared the noisiest of the entire match. It was deafening. To add to our joy, Bardsley was sent off for a rash challenge on Kenedy as he broke down below us. I was convinced that we would now prevail. Our confidence would be high, Stoke’s low, and we had the extra man. Let’s win this one boys. It was more of the same in both periods of extra-time. Tons of Chelsea possession, but unable to break through the Stoke ranks. I loved the way that Mikel was applauded by sections of our support for his steady play throughout the game. He rarely gave the ball away and even played a few fine balls forward. Traore and Hazard came close. The time flew past. Our attempts on goal stacked up, with Stoke only rarely threatening. A fine save from that man Butland from Kenedy was the last effort of the one hundred and twenty minutes. Although I had witnessed penalties on the summer tour in Charlotte and DC, this would be most Chelsea supporters’ first experience of them since a night in Munich over three years ago. I was annoyed that they would be taken, like Munich, at the home end. Stoke – Adam : in. Chelsea – Willian – in. Stoke – Odemwingie – in. Chelsea – Oscar – in. Stoke – Shaqiri – in. Chelsea – Remy : in. Stoke – Wilson : in. Chelsea – Zouma : in. Stoke – Arnautiovic : in. Oh dear. It was all down to Eden, our troubled maestro. A goal for survival, or a miss and a continuation of his personal nightmare. A goal to save Mourinho more misery, or a goal to go in to sudden death. A goal for survival. His run up was relaxed, but his high blast was spectacularly palmed over by Butland. He slumped. We all slumped. I gathered my bag and quietly and quickly left. During the entire evening, there had been nothing but noisy encouragement from the travelling hordes, and this tide of positivism continued as I joined in the clapping of the players as they left the pitch. There was certainly no hint of any boos. It had been a tough loss, but there were lots of fine things to come out of the night. A phenomenal away support had roared the team on. On another night, in any other season apart from this one, we would have won easily. This season, we seem fated to miss out, occasionally by the narrowest of margins. As I drove home, there were similar messages of hope being shared by many. Glenn, his away games a rare treat these days, had bloody loved it. It was a tiring drive home. As I turned off the M4 at Bath, I was plagued with heavy fog lapping at my car, which meant that – painfully – I had to slow right down. I eventually reached home at 1.45am. It had been, I’ll be honest, an enjoyable evening and night in Staffordshire. There were more positives than negatives. I’ve seen us lose so many over the years, that one more won’t kill me. And I always love a sing-song with four thousand close friends. Chelsea vs. Stoke City : 4 April 2015. Maybe it is because Chelsea are now no longer participating in the latter stages of either the F. A. Cup or the European Cup that the end of this current season, to me at least, seems nearer than it actually is. Prior to our home game against perennial scrappers Stoke City, there were still a full nine games left of 2014-2015. Yet, it seemed like the first week of May, let alone April. We still have almost a full quarter of the season still to play. Our final league game is at the ridiculously late date of Sunday 24 May. Yet in some quarters, it appeared that the title was virtually ours. I was having none of that. Knowing Chelsea, there might still be a way for us to bugger it up at the last minute. Our form, let’s all admit it, hasn’t been too brilliant over the past few months. The swashbuckling exuberance of autumn seems distant. Our last excellent league performance was in Swansea at the start of the year. It was agreed in the car and in the pub beforehand that a win against Stoke was all that mattered. It had been a busy pre-match, as they always seem to be these days. There was a slightly surreal feel to everything as I still tried to come to terms with the loss of my mother; these are tough days and nights. The cliché is that Chelsea would be there for me as an emotional crutch, but I wasn’t convinced. As I walked to and from Stamford Bridge to meet up with friends from near and far, my mind was finding it difficult, if I am honest, to concentrate too much on the game. I had travelled up to London with Lord Parky, Bournemouth Steve and also Dean. Dean is one of the many northerners in the Chelsea ranks, from Yorkshire, and who I have known for a few years. He has spent a while back-packing in Asia with his wife, but is now retired and house-sitting in a village south of Bath, no more than eight miles away from my home. It was lovely to have him aboard. As I took my seat alongside Alan and Steve, I spotted a rather poor turnout from The Potteries. If the smaller allocation is 1,400, then surely no more than half of the seats were being utilised. Maybe 600 “Stokies” had travelled down. Overhead there were clouds and the temperature was far from spring like. An impressive Arsenal win against the fading Liverpool had kept the pressure on us. On the large TV screens, a montage of images accompanied “Blue Is The Colour” being played over the PA. Our club anthem, of course, was in the charts back in 1972 to accompany our appearance in that year’s Football League Cup Final against Stoke City. I was a Chelsea fan by then, of course, though I do not remember one iota about that game. For the record, the Chelsea first game that I can definitely remember is the opening game of the 1972/1973 season against Leeds. Yes, them. Just before the teams entered the pitch, the sets of large blue flags – as per usual – began their journey around both tiers of the MH and the top tier of The Shed. I just happened to notice that the one in The Shed – Chelsea FC London SW6 – was temporarily stalled just off-centre. It was stalled for a reason. Above and below it, fans were holding up a few extra banners to provide a pre-match tableau. I took a photograph to capture it for posterity. Good work. The “ruining football” tagline is featured in a famous Chelsea sticker going the rounds at the moment and, as if I really need to explain it, makes an ironic nod to the fools who put all of modern football’s ills squarely at the feet of Roman Abramovich. The team that Jose Mourinho had chosen did not include Diego Costa. There had been reticence in his voice during Good Friday’s press conference when he was questioned about our hitman’s chances of playing against Stoke City. Courtois – Ivanovic, Terry, Cahill, Azpilicueta – Matic, Fabregas – Willian, Oscar, Hazard – Remy. It seemed odd to see us attacking the MH in the first-half. I commented to Alan that we don’t often do this. I remembered a last minute match-winner, a screamer, from Frank Lampard, which beat Stoke in 2009, scored at The Shed. But most last-minute winners have always been at “my” end. As the game got going down below me, I couldn’t help notice – again – the ridiculously varied, and bright, variety of football boots on show. There were blues, whites, yellows, limes, pinks and oranges. 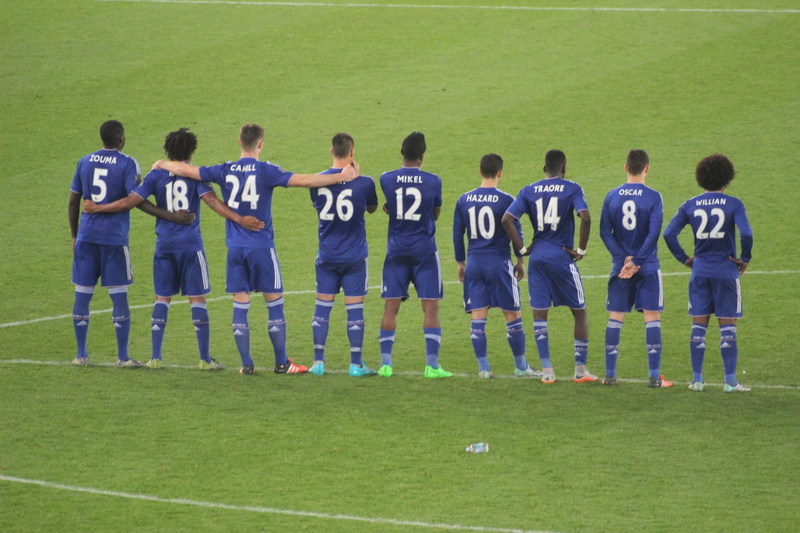 I spotted that just one player, Nemanja Matic, was wearing predominantly plain black boots. I then rolled my eyes when I noticed that the soles were pink. Among the Stoke players, the predominant colour was orange. Many players had them. Red socks and orange boots. Ugh. This surely represented the nastiest jarring of colours seen at a Chelsea match since the ridiculously red-headed David Hopkin appeared in the particularly awful tangerine and graphite away kit in around 1995. We dominated everything in the first-half. Two early chances from Loic Remy, the match-winner at Hull, gave us a sense of hope. Further efforts from Hazard and Oscar followed. Stoke attacks were rare. For all of our possession, there was a typical growing anxiety among the home fans as the minutes passed by with no goal. Oscar was pretty quiet. Matic’ passing was off. Fabregas seemed to want an extra touch. There wasn’t the intensity of previous months. The team looked lacking in confidence at times. Thankfully, on thirty-eight minutes, a run from Fabregas was found by Willian. His quick turn was too much for the Stoke defender Wollscheid (who?) and a clumsy challenge gave the referee no option. Eden Hazard calmly rolled the ball past Begovic. The crowd responded with a guttural roar. Alan : “They’ll have to come at us now, ducks. Stoke responded in typical fashion, leaving Fabregas bloodied after a challenge by Charlie Adam. Just before half-time, the Chelsea crowd were howling after a tackle on Hazard down below me was not punished, but as the ball was moved out to that man Adam, few of us could have been prepared for what followed. Inside his own half, by around ten yards, the unlikable midfielder looked up, spotted Thibaut Courtois off his line, and pummelled a shot high into the air. It carried on and on, and although hit with precision and pace, seemed to take forever to reach its intended target. The back-peddling Courtois leapt but could only palm the ball into the net. The away supporters, quiet until then, roared in delirious pleasure. Courtois could not be blamed surely. It was a stunning goal. When it was replayed back on the screens at the break, the strike was applauded by a few in the home areas. That doesn’t happen too often. Jose replaced the miss-firing Oscar with Diego Costa to offer support to Remy. However, after just ten minutes, Diego pulled-up with a hamstring problem. This was a massive blow and I wondered if things, on the small scale of the match and of the large scale of the season, just got a lot lot worse. Didier Drogba was introduced. The dices were being rolled. Thankfully, the home crowd, realising that the team needed us, got going. The atmosphere had been so-so in the first-half so I was very thankful, and rather surprised if I am honest, to see things improve rapidly. Down below me in the MHL, the spectators – standing, always standing – provided a riot of noise, with the “Matthew Harding’s Blue And White Army” chant going on for a while (with associated clapping – which the MHU joined in with.) It was a lovely sight and sound. I had warned two first-time visitors from Washington DC about the lukewarm atmosphere at games of late, but I was so happy for them that this surprising din was turning The Bridge into a proper stadium once more. Just after the sixty-minute mark, a poor clearance by Begovic was picked up by Willian. He moved the ball to Eden, who selflessly played in Remy. Rather strangely, Mourinho immediately replaced the goalscorer with Juan Cuardrado. N’Zonzi hit the outside of Courtois’ right hand post. The atmosphere inside the stadium grew tenser with each passing minute. This was certainly not an enjoyable game of football. With an equaliser only one kick away, nobody could relax. Begovic miraculously stopped Cuardrado not once but twice from close range. The seemingly endless list of Stoke players receiving yellow cards continued as substitute Crouch launched a scissor attack on the resilient, and brilliant, Hazard. Four minutes of extra-time was signalled and as the last few seconds ticked by, my eyes were on referee Jonathan Moss. On the walk out of the stadium, one phrase was often repeated.